If you’re going to celebrate Halloween (Friday October 31 2014) this year, we suggest you go all out. Head down to your local costume shop and prepare to scare at one of the capital’s best Halloween parties. Plan your fancy dress in advance. To celebrate the spooky holiday in a particular way, Pavtube Studio just released Halloween Celebrations Topic page related to everything you should know about Halloween Costumes, Makeup, Masks, Feast, Pumpkin, Candy, Games and other DIY stuff etc. Learn more on Halloween column: http://www.multipelife.com/halloween-topic-2014. Pavtube Studio has prepared “2014 Halloween Hot Giveaway and Crazy Discounts” for you. From now till Nov. 10, 2014, we are giving out our best-setting Blu-ray/DVD ripping tools and video converters with big promotion as holiday gifts. 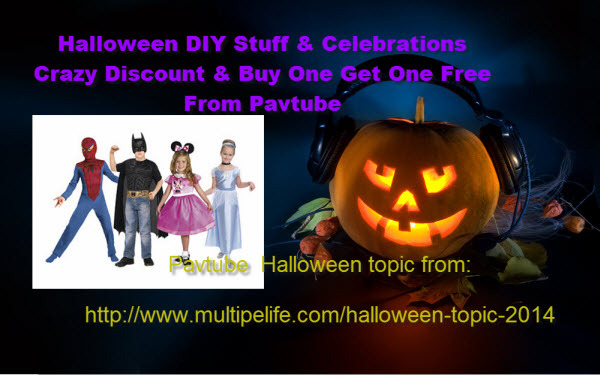 What can you expect at Pavtube 2014 Halloween Big Deal? If you love records the happiness time of your children, you can uploaded one of your Halloween videos (or any other videos related to Halloween shot by you) to YouTube, and send the URL of your YouTube video to dvdwinsupport@pavtube.com or dvdmacsupport@pavtube.com. And get 50% off on any converting tool from us. The discount link will be sent from us by email within 24 hours on work days. Your action will drive us to plan more and bigger sales. 1.Buy Pavtube Video Converter Ultimate(Win/Mac), get Pavtube ByteCopy(Win/Mac) free. 2.Buy Pavtube BDMagic(Win//Mac), get Pavtube Video Converter(Win/Mac) free. 3.Buy Pavtube DVDAid(Win/Mac), get Pavtube MTS/M2TS Converter(Win/Mac) free. 4.Buy Pavtube HD Video Converter(Win/Mac), get Pavtube DVD Creator(Win/Mac) free. The Pavtube Blu-ray/DVD/HD Video Converter series will help users out of the trouble. Users only need to sit on the sofa with remote control in hand, then next disc or chapters will appear by only several clicks.Come to grab the buy one get one free and special software pack to send them as Halloween gifts to good friends. Don’t be scared to take advantage of some terrifyingly great deals available on software which can potentially save you dozens of dollars.